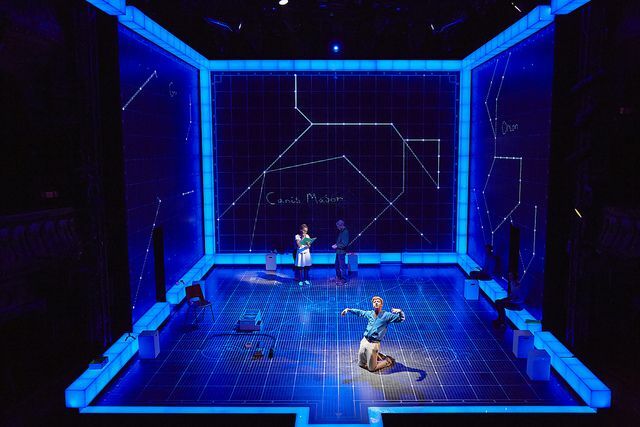 Hull New Theatre were fortunate to have the touring production of Curious Incident of the Dog in the Night-time this week and after seeing rave reviews from fellow theatre-goers, me and the boyfriend managed to catch it before it moves onto a different location. The Curious Incident of the Dog in the Night-time is narrated wonderfully by Christopher, a 15 year old (actually… 15 years and 3 months and 2 days) boy with Asperger Syndrome who found his neighbor’s dog with a garden fork in it. The story follows him throughout his investigation of who killed poor Wellington, the neighbour’s dog, but then finds himself finding more questions and you (whether reading the novel or watching the play) have an insight of how Christopher thinks, through trains, space and mathematics. The Mark Haddon novel has been adapted to stage by the National Theatre (who also created War Horse – my now second favourite theatre piece) and is in the West End and Broadway, as well as the now touring version. As someone who’s dedicated 10 years of my life in theatre as well as doing a few shows at the New Theatre – straight away my attention is diverted to the staging. It can’t be helped! The set is simplistic and set to grids but has many functions with the help of video, moving lights and secret doors and hatches throughout the performance. Props are simple yet effective – with light boxes being used to manipulate objects such as a television, cooker and tank; as well as simple white boxes storing variant props that could be doubled for practical props themselves and creating levels on stage. The cast demonstrate strong skill of storytelling with the compliments of the set. The actor (Joshua Jenkins/Chris Ashby = variant on performances so I wasn’t sure who I saw) who played the role of Christopher has some talent to ensure that the mannerisms of his behaviour was consistent and demonstrate to us his thought process and ambitions with the help of the set, and how his mind works throughout the frustration and the fear when being placed in difficult situations such as travelling to London on his own. The ensemble all support him well on stage throughout relationships and physical theatre, all choreographed smoothly and in sync. But each one of them, including the main characters, demonstrated the reality of how we all treat with those with Aspergers Syndrome. To some, we see Aspergers Syndrome as someone that’s an outsider and can be quite intolerant to their mannerisms – not out of pure ignorance, but perhaps not understanding why? I’ve worked with students who have Aspergers Syndrome and understand that they have different needs to ensure they’re safe – but as demonstrated when Christopher takes the challenge to travel to London on his own, sadly the reality is people aren’t as oblivious to it. I know Mark Haddon does feel uncomfortable when the book is given to police/social workers as a textbook of some insight of the people they may come across – I agree in a sense as each person with Asperger’s will vary, as afterall those with AS are unique individuals. But it does focus on our attitude to those who have it, and that is something we need to be aware of. Throughout the show, I admittedly felt quite emotional throughout. It wasn’t just the set, sound and lighting that gave me goosebumps; it wasn’t just the story throughout; it certainly wasn’t the puppy that came on (the boyfriend wasn’t so impressed when I gripped his arm and squealed a little as they produced the ADORABLE Labrador puppy on stage) – it was the relationship and emotions each character that touched me. You felt for Christopher when he found the letter and saw the trust between him and his father disintegrate immediately when he finds out the truth; his mother’s frustration when Christopher didn’t understand why; Siobhan’s working relationship with Christopher at the School; even Christopher’s love for Toby the rat! It was certainly a rollercoaster of emotions. Beforehand, I hadn’t read the novel but in the interval of the show – I rushed to the stand to buy the novel as well as some badges! The book layout is also demonstrated in the way that Christopher thinks with his love of prime numbers and mathematics – definitely looking forward to be reading this! So – if I haven’t spoilt it for you (there is a disclaimer at the beginning of this entry), I wholeheartedly recommend you to read or see this amazing piece. Definitely my number 1 favourite piece of theatre!